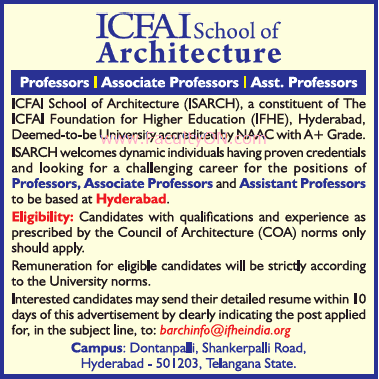 ICFAI School of Architecture, Hyderabad has advertised for recruitment of Professor / Associate Professor / Assistant Professor jobs vacancies. Interested and eligible job aspirants are requested to apply within 10 days from 28th November 2018 05th December 2018. Check out further more details below. About College: The ICFAI Foundation for Higher Education is declared as a Deemed to be University, under Section 3 of UGC Act. 1956. It has evolved a comprehensive student-centric learning approach consisting of several stages, designed to add significant values to the learner's understanding in an integrated manner, covering relevant knowledge, practical skills and positive attitudes. The IFHE is a member of the Association of Indian Universities (AIU) and Association of Commonwealth Universities (ACU). How to Apply: Interested and eligible candidates are requested to send their application along with CV, one set of copies of certificates, copy of PAN card, copy of Aadhaar card and recent PP size photo to the email address provided here. Clearly indicate the post applied for in the subject line of email.